If your business is operating and generating revenue of any kind, chances are you have liability exposures. Whether it be a slip and fall, your product harming someone, or even frivolous lawsuits; you need a plan to deal with these problems before they happen. There are a couple ways to address these issues, but in this post we will be talking about the most common method – commercial general liability insurance. General liability insurance is the transfer of risk onto a 3rd party. This is an agreement that is between you and a insurance company that says that they will pay for any bodily injury or property damage that you caused (or even allegedly caused) that is covered by the policy. This transfer of risk is what allows you to operate your business however you want and offload certain risks to another company for an annual (or monthly) premium. I could go on forever (and probably will on another post) about the original intent of insurance. But the original intent of insurance goes back hundreds of years. In the early days of Lloyd's of London the purpose of insurance was to financially back entrepreneurs (sailors) so that they could get goods and services over to America. It helped the sailors, the economy, and the investors. In modern days insurance isn’t quite as simple, but the same simple principles apply. Insurance allows entrepreneurs and businesses the ability to take risks and do what they do best without worrying about how they will pay for a liability lawsuit or losing all their property. It is the tool that allows people with great ideas to create a better world without having massive resources. It is true that all businesses don’t carry the same risks. A restaurant does not have the same liability as an aircraft manufacturing company. I would even say that no two businesses in the same industry carry the same risk. What these posts aim to achieve is equipping you with the tools to understand what you need from insurance and give you with the knowledge to present yourself in a way that allows you to obtain the best coverages at a price that none of your competitors are getting. Interested? The Commercial General Liability policy begins with a LOT of coverage. The rest of the policy will be defining and narrowing down this insuring agreement. Even though the insuring agreement is similar in most policies, what comes after is what you should review very closely. An Example of a General Liability Claim Leon owns a plumbing company called “Leon’s Best Plumbing Company, Inc”. Recently Leon’s Best Plumbing Company, Inc was involved in a bathroom remodel for a residential customer. It was later discovered that the pipes were installed improperly and consequently flooded the house causing $75,000 in water damage. Would this be covered? In most general liability policies, the damages outlined in this example would be covered because it is “property damage” the insured caused a person or company. It would be nice if every liability policy were just the “insuring agreement”. We would be able to save a lot of paper and spend a lot less time reading over insurance forms. Sadly, this is not the case. The rest of the policy is used to define and limit the coverage from all “bodily injury” and “property damage” to what the insurance company REALLY wants to cover. Each policy comes with its own set of exclusions. As a business owner it is worth your time going over every exclusion on your policy. The policy will not pay for claims that result from intentional damage. One cannot purposely cause bodily injury or property damage and expect a liability policy to respond to the claim. the insurance policy does not cover additional liabilities that you assume in a contract unless you would have been legally responsible without the contract. Liability insurance is a 3rd party coverage that covers damage that you cause to other parties or entities. A liability policy will not cover bodily injury or property damage to yourself. This coverage is purchased on other types of insurance such as commercial property or workers compensation. the commercial liability insurance policy will not pay for or replace the work that you performed, only the work of others that your product or work damaged. This exclusion is often described as the inability to use commercial general liability as a warranty policy. Although other policies can cover this exposure, liability insurance will not pay for the costs associated with recalling your products. This insurance will not pay for most claims arising out of the handling of electronic data. This coverage is found on a separate cyber liability insurance policy. 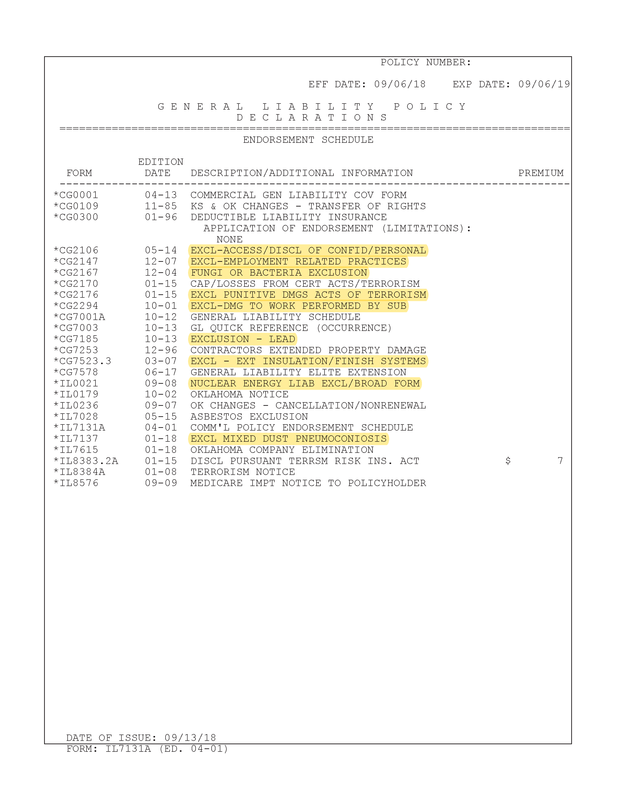 Below is an example of an endorsement schedule for a general liability policy that comes with every commercial insurance policy. On the liability policy you want to look down the list and find the endorsements that say “Exclusion” or any variation of the word. I have highlighted the example below in the method just described. These are the items that you should keep track of and discuss with your insurance broker. Every liability policy will come with exclusions. It is an unavoidable reality of commercial insurance. As a business owner, you just need to know what those exclusions are so that you are more aware of your potential exposures. If any exclusion is a deal breaker, you can often find coverage with a separate policy or see if any insurance carrier will provide coverage with the terms you need. Oftentimes insurance policies will include an endorsement that limits coverage to a select location, operation, or both. Essential the insurance policy will only cover the select operations or locations that you provide to them at the onset of the policy. The presence of these endorsements are sometimes unavoidable, but both you and your insurance broker should be aware of these limitations. You should also let your broker know about any work that might not fall inside the limitations. Usually listed as the CG 2294 endorsement, this excludes coverage to any independent contractors or subcontractors. If you are hiring (or even considering hiring) any subcontractors, it is critical that this is removed. Oftentimes this exclusion can be removed for a couple hundred-dollar charge. It is worth it if a subcontractor were to leave you responsible for any damages. As mentioned above, looking at your endorsement schedule page is something that you should commit to doing every renewal. It is a very quick process that can save you potentially millions of dollars. Just because you are renewing with the same carrier does not mean that there are no new exclusions or limitations on the renewal policy.